BROOKLINE — Actors’ Shakespeare Project has always seemed to relish a challenge, crafting an itinerant identity as the theater company wanders from venue to venue, adapting to different spaces while staging works by its namesake playwright and, occasionally, the likes of Chekhov and Ionesco. This month, the company is mounting two productions while staying put in one place (the sanctuary of Brookline’s United Parish), but still aiming high — indeed, undertaking one of the most ambitious projects of the fall theater season. So both productions are about “Macbeth,’’ and both have plenty to recommend them as they unfold beneath a pair of large wooden arches (set design is by Jon Savage). 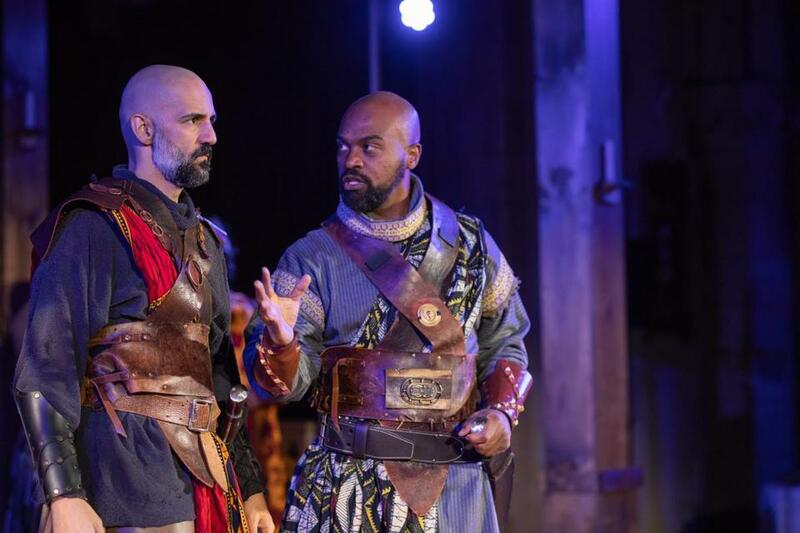 Appearing in both “Macbeth’’ and “Equivocation’’ are some of Boston’s best and most versatile stage actors: Nacer, Barkhimer, Maurice Emmanuel Parent, Ed Hoopman (who is aces, as usual, in a variety of roles), and Kai Tshikosi. Clever and sharply written though it is, “Equivocation’’ is overlong, causing the play to lose some altitude in Act 2. As for “Macbeth,’’ the decision to employ a “modern verse translation’’ by playwright Migdalia Cruz is not likely to sit well with purists, given that his glorious, unrivaled language is what makes Shakespeare Shakespeare, and “Macbeth’’ is one of his most accessible plays. That said, Cruz seems to have approached her task conscientiously. Her “translation’’ is not dumbed-down, “No Fear Shakespeare’’-style, but rather follows Shakespeare’s use of iambic pentameter and other poetic forms while pruning archaic terms. This “Macbeth’’ is part of a project launched by the Oregon Shakespeare Festival, which commissioned 36 playwrights to “translate’’ 39 Shakespeare plays into “contemporary modern English’’ while retaining “approximately 80 percent of the original heightened language,’’ according to press materials. Whatever you think of the idea of fiddling with Shakespeare’s words, this fast-paced “Macbeth’’ retains the play’s power to transfix. His head shaved and sporting a salt-and-pepper beard, Nacer delivers a fiery, full-throttle performance as Macbeth that ranks among his best. His grief-wracked rendition of the storied “Tomorrow, and tomorrow, and tomorrow’’ speech, delivered after Macbeth learns of the death of Lady Macbeth, will stay with me for a long time. Parent’s Banquo is such a forceful presence that you have no difficulty believing this is a guy who would find a ghostly way to haunt you even after death. Hoopman makes for a charismatic, commanding Macduff, equally compelling in his anguish after the slaughter of his family and in his determination to put an end to Macbeth’s reign of terror. However, Paige Clark’s Lady Macbeth doesn’t register vividly enough to elicit the chill that lethal lady should induce. Her portrayal could use some of the menacing aura Clark conjures for her brief portrayal of Hecate, goddess of witchcraft. (Every member of the cast plays more than one role.) As Duncan, king of Scotland, whom Macbeth bloodily dispatches on his way to the throne that the “weird sisters’’ have told him is his destiny, Barkhimer is uncharacteristically passive. But before that, he has to wrestle with his commission/ultimatum (“Here’s my options: Lie or die,’’ he says gloomily), and try to gain the cooperation of the restive members of his acting company (played by Hoopman, Parent, Nacer, and Tshikosi). Shrewdly observing and commenting on it all is Shag’s daughter, Judith (Kimberly Gaughan, excellent), who enjoys tweaking her father by reminding him of precisely how many people he has killed in his plays. “Equivocation’’ is both astute and funny in its depiction of the travails of a working playwright — even if that playwright is William Shakespeare — and of a life in the theater. One of those travails is the possibility no one will see your work. The pews were sparsely populated at the performances of “Macbeth’’ and “Equivocation’’ that I attended. Here’s hoping Actors’ Shakespeare Project is rewarded for both its ambition and its execution with much bigger audiences from here on.